A5, 62 black and white pages. On the back cover of this zine lies a strong statement. 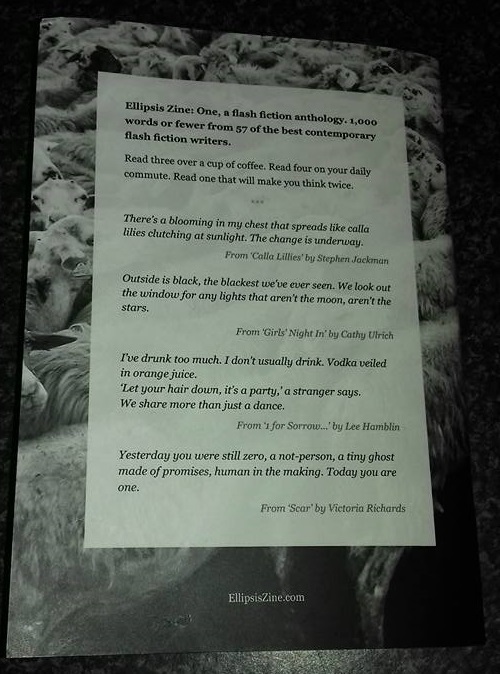 “Ellipsis Zine: One, a flash fiction anthology,” it explains, “[contains] 1000 words or fewer from 57 of the best contemporary flash fiction writers”. Hmmm, we’ll see, I thought to myself, flipping back to the first page. It’s fairly common for zine makers to be enthusiastic about the work they produce, sometimes so enthusiastic that it becomes difficult for the material itself to measure up to expectations. So, when I see creators using words like “best”, I become cynical. As it turns out, the editor of Ellipsis Zine (Steve Campbell) wasn’t far off when he used that bold little word. I spent a week reading this zine; a handful of stories at a time whenever I had a spare moment, and I can say with confidence that there isn’t a weak link in the collection. These stories are literary fiction in its tightest form. Each word has a purpose; scenes are written so cleverly that only a few brief paragraphs are necessary to project an entire story into the mind of the reader. 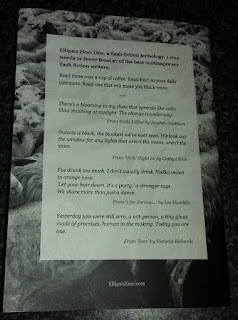 Late one night I read My, She was Yar, by Zoë Meager, only to lie awake in bed wondering about how young families cope when a child dies. Several days after reading Bird Girl, by Janelle Hardacre, I was still daydreaming about how technology could progress in the next few years, and the impact that would have upon our identities. Each story is unique, and yet they are drawn together. The number one appears in this collection again and again, as a young girl’s new home, as a lost love sitting one carriage away, as the sole meeting between father and child, as a missed opportunity with a one true love*. 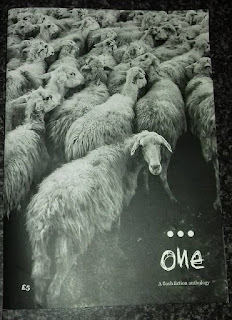 A flock of sheep trample across the cover, all moving forward save for one, who looks back at the reader. Whether the recurring number is a conscious choice by the editor is ambiguous, but I prefer to believe that all these number ones are kismet, unexpectedly brought together for the first print issue of Ellipsis Zine, for its number one. I had two warring emotions as I read this zine. As a reader, I was delighted. As a writer, I was filled with envy. Issue one of Ellipsis Zine can be bought from their online store, here, and for news and updates follow them on twitter. *House Number One by Eleanor Jones, One Carriage Away by Amanda Quinn, What Happens When Hot Air and Cold Air Meet? by Danny Beusch and Daisy Chain by Debbi Voisey, respectively.